Useful, efficient, and networking-available space. Coworking space ‘digilabo’ is a place that meets modern needs for a new kind of work environment. This unique environment provides you with comfort and efficiency, and also chances for networking like a lounge. There are various kinds of people like who are sitting at their usual seat by the window concentrating on work, having meetings in the meeting booth, studying with their text books all over the long desk, indulged in their hobbies, and buried in thought on the sofa. Sometimes, people are inspired by other people making efforts and achieving different goals, and able to come up with new ideas through casual conversation. A free-spirited, relaxing environment with a right amount of tension. Inspirations through communication. An organic space with creativity. A place where numerous stories are born. A wide open space. An open workspace with free-address seats is the center of ‘digilabo.’ Unlike usual offices, we provide a comfortable, open environment, efficiency and a place for casual communication, for long-working creative workers. Along with small and large lockers, multi-function printers, shredders, we also have power supply and wireless LAN. 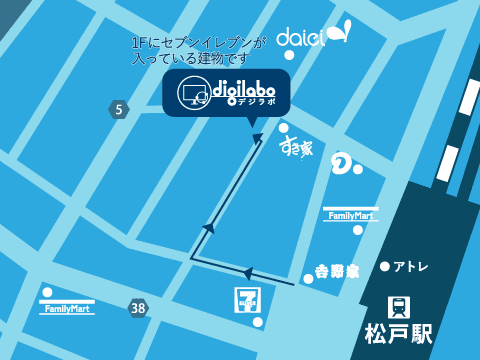 There is a convenient mobile space, along with mail reception service and ability to use ‘digilabo’ as an office space after corporate registration. ‘digilabo’ has various office residents with different backgrounds and ways of working. “I love the relaxing environment.” “I want to be inspired and be associated with all kinds of information.” Residents have a similar way of thinking about their workstyles. Even if they have different jobs and backgrounds, they all seem to get along. During open hours, there are plans such as which you can use ‘digilabo’ as an office for an unlimited amount of time, or for people who are working in other companies that want to use the office for a limited time. You are able to choose the best plan that fits your occasion. There are other options, such as corporate registration and mail receiving by using lockers. You can fully use this comfortable and convenient atmosphere as a location for your business. The prices are all tax-included. Registration is unnecessary. You can immediately use the service when you arrive! Please note that you cannot change the course you have chosen afterwords.